A cat born with deformed legs has made the 8,000-mile, 20-hour journey from Tehran, Iran, to San Francisco, and is now looking for a home in America. Maloos after he was found on the streets of Tehran. Maloos, an orange-and-white feline, was found on the streets of Tehran by Sayeh Animal Guardians, an Iranian animal-rights group. 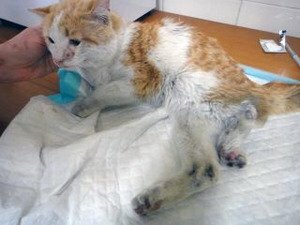 The homeless cat was covered with sores and dragging its rear legs behind him, the result of a birth defect. He also had a piece of shrapnel lodged in his face near his left eye. Resources to care for animals are severely limited in the Middle East country, and advanced surgical procedures for cats are extremely rare. Despite these limitations, Iranian veterinarians tried to repair one of Maloos’s legs; unfortunately, the limb became infected and had to be amputated. Uncertain of the animal’s future and hoping to give the cat a shot at a better life, Maloos was sent to San Francisco, where he currently resides at SF Animal Care and Control. Since arriving in the America, the cat is reportedly doing better, and has had the shrapnel extracted from his face. Anyone interested in Maloos (see video below), or to make a donation for his continued care, should visit the City and County of San Francisco’s Animal Care and Control website.